There are no good ways to solve a budget crisis like the one facing the Legislature’s Appropriations Committee. We’re not referring to the governor’s biennial budget — which has drawn plenty of attention for its proposal to end municipal revenue sharing — but the supplemental budget. The Legislature must act on this proposal first because there’s a deadline: The state must make cuts to balance out projected revenues by June 30. And right now there’s an approximately $153 million hole. Much of the shortfall has been exacerbated by past policy decisions. It’s likely to only get worse, as income-tax cuts passed by the previous Legislature — which are projected to cost the state about $342 million over the two years covered by the biennial budget — took effect in January. Appropriations Committee members’ goal should be to construct a supplemental budget that does as little harm as possible, so lawmakers can fully focus on the two-year budget — to address the large problems that required state government to need a supplemental budget to begin with. In dealing with the biennial budget, the Legislature must examine the tax code, to see how to generate more revenue. It must get a better handle on how to track spending within the Department of Health and Human Services. If the Legislature does make cuts, it should ratchet them down over time, in a responsible way. It should invest in programs that show long-term results, like quality care for children ages birth to 5. Most of all, we want legislative leaders to promise that they will focus on what will actually grow Maine’s economy over time — by helping people get out of poverty and by not adding to the property tax burden already borne by the middle class. 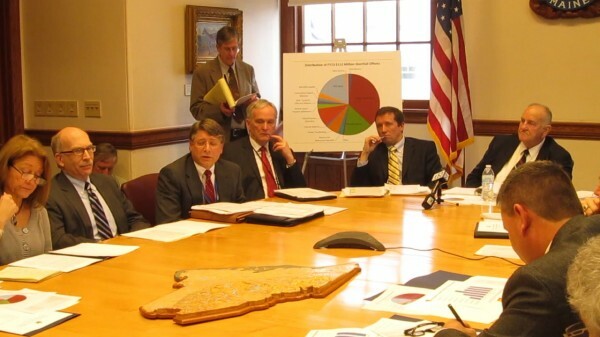 But right now the Legislature has to fill this year’s shortfall, which is mostly caused by MaineCare spending and worse-than-anticipated revenue forecasts. Gov. Paul LePage has proposed to fill much of the shortfall — a total of $47.7 million — by targeting funding for local schools. Of that amount, $12.6 million would be a reduction in state subsidy. The biggest sum — $18.5 million — would be a temporary deferral of the schools’ June 2013 payment to July 2013. The deferral is a budget gimmick — the sort of tactic LePage campaigned against — and the Legislature should only support it if it knows the state will be able to make 13 payments during the next fiscal year. If the deferral is approved, districts will likely have enough cash to carry them through a couple weeks before they receive state subsidy payments. If they don’t, they can delay nonpayroll related expenses, or, in a worst-case scenario, get a revenue anticipation note. Legislators must, though, be able to return to schools in their districts and explain with straight faces that long-term fixes will be in the biennial budget. Slashing funding does not constitute a long-term plan. The state doesn’t completely face an “either/or” scenario where it must take money from one line item or else cut another. The Appropriations Committee could choose to defer more education subsidy money. Or it could propose raising the Maine lodging tax. But how many payments can the state defer and still be able to pay all the districts in July? By the time the lodging tax change took effect, how much additional revenue could it generate for the state in fewer than five months? Don’t look for help from the “rainy day” fund. The governor’s proposed budget, which the Appropriations Committee is reviewing, would drain reserves by nearly 95 percent. Again, only cutting services does not create a sustainable plan for growing Maine’s economy and protecting the vulnerable. How many more supplemental budgets will Maine endure before Republicans stop focusing on tax cuts, and Democrats stop acting defensively about programs, and the two sides work together on an actual budget strategy? Clearly both former Democratic Gov. John Baldacci and LePage have failed multiple times to balance the budget. The Legislature should cast off past approaches and draw from the expertise of experts when crafting a biennial budget. Though the governor’s supplemental budget proposal has selected the “less bad” options from even worse options, the crisis is largely manufactured. Having continuous supplemental budgets is no way to run a state and indicates a need for more long-term planning. May the Appropriations Committee members and Legislature move past the supplemental budget quickly, so they can focus on fixing the larger problems that brought on the need for the supplemental budget in the first place.